An occasional Portland Transport commenter and longtime reader, Nick Schillaci is a world traveler, who has been a foreigner on transit on every continent. He holds a humble BS in Planning and Public Policy from a little-known University of Oregon program, and has been a TriMet rider for decades. I greatly enjoy both Red and Green lines, and I don’t think we need any radical Green or Red line changes. I would never propose something as radical as to operate both Red and Green trains as the same line all the time. But could service be boosted from blending the Red and Green line trains? There is a lot of color-changing between Red, Blue, and Green lines in the evening, so simplification, frequency, cost savings, consistency, and mobility all come in to play. Each weekday, between 8pm and midnight, there are 29 trains between Gateway TC and downtown (Blue, Red, and Green). This means there are about 6-7 trains per hour, or an average of about every 8-10 minutes. 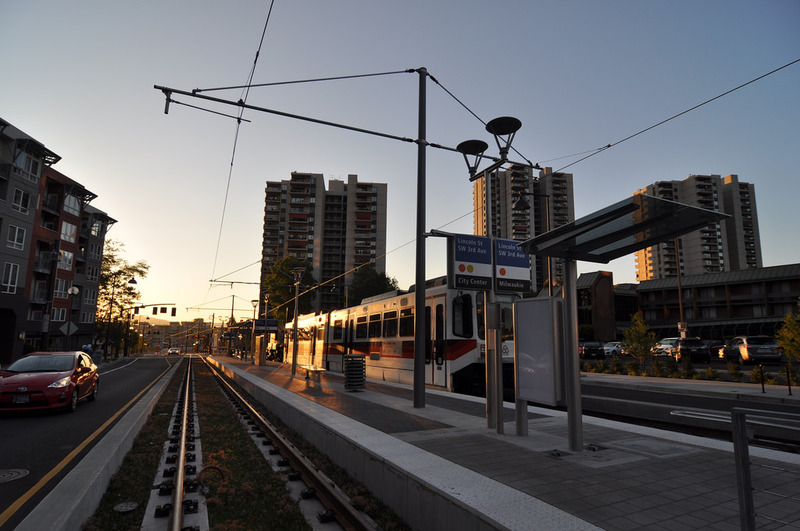 The Blue line alone operates at frequent service intervals until past 9pm, while the Red and Green lines operate less frequently. The Red line, in fact, ends service among the earliest of all MAX lines, with its last departure from PDX at just around 11:45pm when there are still about 15-20 arrivals at PDX (I’m counting some close calls, so maybe you need 45 -60 minutes to get off the plane, grab bags, and catch the last train comfortably, if it’s on time). Extremely high inbound late night frequency aside, notice the redundancy and gaps. Trains at 10:23, 10:30, and 10:33, and then no trains until 10:58. Three trains in ten minutes, then none for 25 minutes. Blue lines continue just about every thirty minutes through the end of their service, and Green lines, on the other hand, stutter to a halt (most continue east as Blue lines and terminate at Ruby Junction). Green line trains also stop operating relatively early. The Yellow line, for example, has a PSU departure an hour later than the last Green line. So given that very little service would be lost along Green and Red lines due to redundancy and service span of interlining routes, here’s what I’m getting at: evening-only service between PDX and CTCTC. The switches appear to all be there at Gateway for the trains to do such a thing. If you’d like to call it something more unique, why not call it the Purple line. Because travel time between Gateway and Beaverton on the Red line takes a whopping 47 minutes (thank you downtown Portland) and travel time on the Green line between Gateway and PSU takes 25 minutes, over an hour and ten minutes is saved for each pair Red and Green lines that don’t continue past Gateway. Of course, this number doubles when they don’t return for a savings of 140 minutes (not counting layovers). This all matters, because trains operating from Gateway to Downtown and beyond are all redundant service over the Blue and Yellow lines (and eventually Orange). How many riders would be turned off from a possible transfer to downtown? Some riders from the airport already may have to transfer (to go east or south from Gateway, East to Gresham, or beyond Beaverton). With the time saved, a couple more Blue lines could be added at night to make up for the lack of Red lines continuing (especially since the Red departs Gateway later than the last Blue currently). This plan could also effectively boost Red and Green line service later in the night, with more frequency (a round trip between Clackamas and Airport would take about one hour). 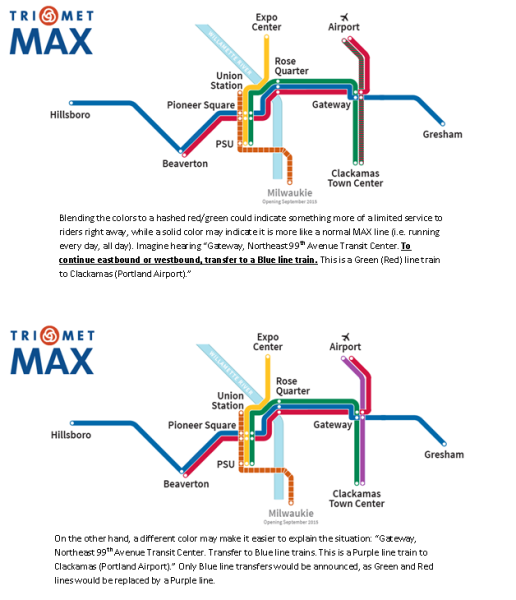 With the addition of the Orange line operating as a redundant Portland Mall line, no service needs to be lost through downtown either. I was out walking downtown this weekend when I noticed that Trimet has updated the rail system map to include the pending Orange Line route. I snapped a photo with my camera and while the news is nothing worth getting excited over, it does provide some changes to the existing map that make different regions a bit more clear. 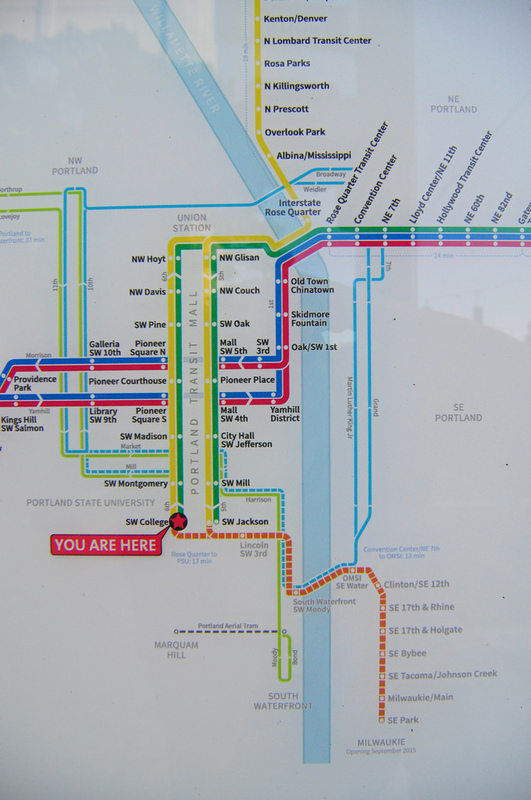 Included on the map is also the closed loop of the Portland Streetcar Central Loop. Both routes are shown as “future service” and while the CL line future service is not in doubt, the new map answers no questions about future Orange & Yellow line service. Where will the Orange Line end on the north end of the route? Will the Yellow Line extend further south as some of the new platforms indicate? The new maps provide no answers to these questions. 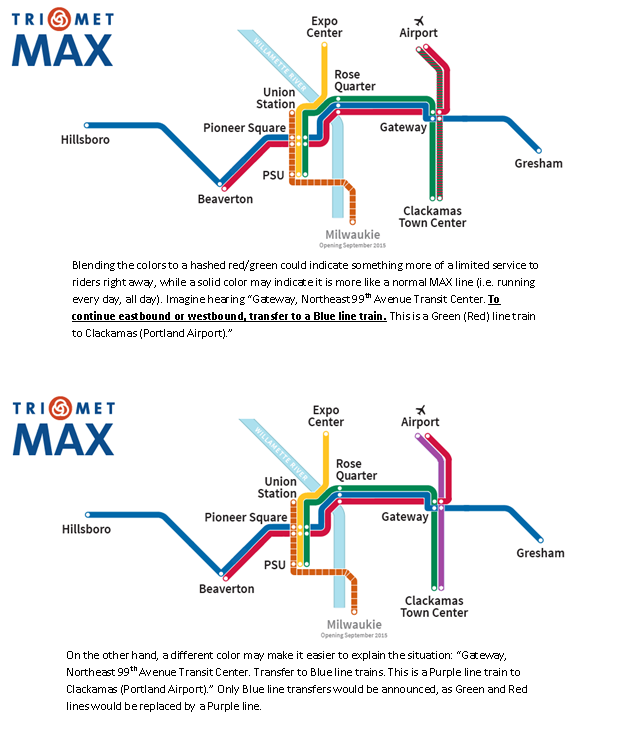 I’m left wondering why Trimet went to the trouble of producing new maps that will be obsolete a year from now. The appearance of the new map coincides with this morning’s first test of the Orange Line though which, when taken together, represent some visible forward momentum in the downtown area where the Orange Line is concerned. My Twitter feed has been abuzz again this weekend. This time with news of a study that shows a reduction in auto traffic (and emissions) following startup of a light rail line (in Salt Lake City). This is apparently a first. Not having a demonstrated result like this has always been an arrow in the quiver of rail skeptics. I’m sure they’ll find ways to dispute this study… or just call it an outlier. While I’m happy to see this, I’ve always thought this was an elusive thing to show, primarily because any passengers diverted from their cars were likely to be replaced from a pool of latent demand (I strongly suspect that Highway 26 in the Portland region works this way). So High Capacity Transit’s big benefit was in absorbing new demand in a corridor, not in diverting existing demand. But maybe, and I’m just guessing here, in the light of declines in driving nationally, the pool of latent demand is diminished and we can actually show HCT taking demand away from SOVs. Wouldn’t that be nice!